Vainglory is a deep, uncompromising real-time MOBA where you will fight against real opponent. In this fast-pacing game you take control of powerful heroes, destroy the enemy Vain crystal and claim glory! It also allows you take part in 3 vs 3 multiplayer battles online. Discover what the developers of this intense MOBA (formerly at Riot Games & Blizzard Entertainment) have to say about their game. Can you give us 3 reasons to download Vainglory? Vainglory is designed from the ground up for mobile devices to bring a deep core gaming experience to new platforms. Players feel the highs and the lows, the excitement and anticipation, the rage when you lose a match and the feeling of pure joy when you win, all from a mobile device. MOBAs are most fun when played together with friends in the same room, which is one of the reasons the tablet is a perfect platform for Vainglory. Say goodbye to dragging gaming rigs to a friend’s house! With Vainglory, friends can battle for hours with only a mobile device in hand. 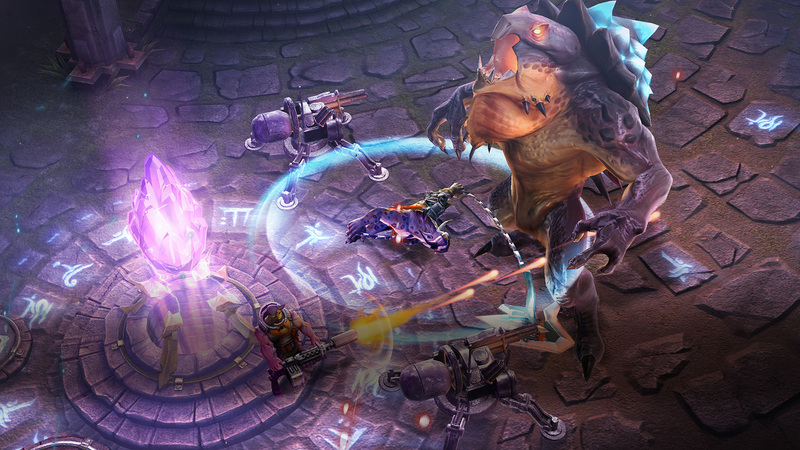 Vainglory is free to download and endlessly free to play. We do not restrict your gameplay with timers, pay-gates or other mechanics that impede your ability to play. We are core gamers ourselves and we treat our players the way we would like to be treated. Can you explain what Vainglory is for those who never played the game? Can you tell us a bit more about the team behind this game? Super Evil Megacorp is a team of masters-at-their-craft game developers from companies including Riot Games, Blizzard Entertainment and Rockstar Games. The company is made up of four founders: Bo Daly (CEO), Tommy Krul (CTO), Stephan Sherman (CCO) and Q Wang (CPO) as well as core game and mobile industry experts such as Kristian Segerstrale (COO & Executive Director), Carlo Arellano (Art Director) and more! Our team is comprised of passionate and lifelong gamers who evaluate and play Vainglory everyday to ensure that what we share with the world, is a game we are proud to be a part of. We’re not just another faceless corporation; we’re a close-knit family driven to bring the very best game experiences to mobile devices, one battle at a time!